SPL Titanium Rear Mid Links replaces the stock mid links to offer complete control over rear toe, rear spring rate and ride height. 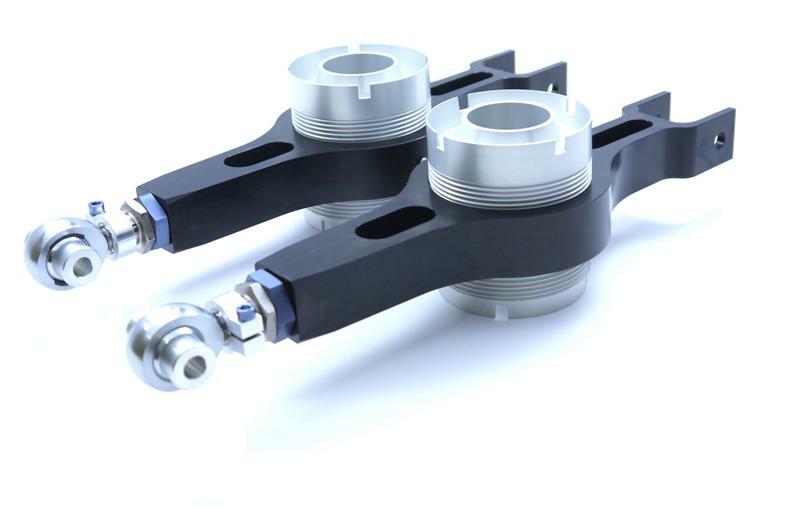 The threaded spring perch allows corner weighting and fine adjustment of ride height, and accepts 2.5” ID standard springs, allowing users to choose from a wide range of springs of different spring rates and length. SPL Titanium Series Mid Links are CNC machined from T6061 billet aluminum for light weight but high strength and stiffness. SPL’s exclusive 4130 chromoly hybrid adjuster offers quick and precise adjustment, and is CNC gundrilled to reduce weight. Blue anodized titanium hardware shaves even more unsprung weight from the arms, without compromising strength. Pair with SPL Titanium Rear Camber Links and SPL Eccentric Lockout Kit for total rear camber and toe alignment with “zero-slip”.